All games in our list ended the first half of the year with fluctuation on their RMT prices. 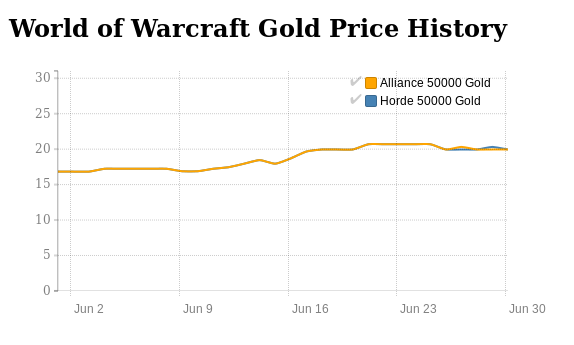 ArcheAge Gold, EVE Online ISK, and WildStar Gold prices had been up and down throughout June. Blade and Soul Gold and Guild Wars 2 Gold price finally stopped decreasing unlike SWTOR. Tera was doing really good with their current costume strategies. World of Warcraft and Final Fantasy price were significantly increased because of their latest/upcoming patch updates. ArcheAge Gold in June quite fluctuated. It regularly had a sudden 10 percent drop for a day or two throughout the month. Sometimes, the price just went down for almost 20 percent without any reason as well. The in-game currency average price was slightly higher than May thanks to the recent patch update 2.9 released at the end of last month. XLGAMES Inc surprisingly quickly posted a new trailer for patch 3.0 with the introduction of new races and areas. However, the release date of the newest patch is still unknown. ArcheAge Gold price is expected to stay in this range in July. It might go up slightly if patch 3.0 is launched. The cheapest Archege gold was on June 24, 2016, which is 2,000 ArcheAge gold for (US) $28.34 and the most expensive was on June 32, 2016, for $34.32. It is at 21.53% difference. June is a strange month for EVE Online ISK. It had a rapid drop for 3 times. Sometimes it was a great decline of almost 30%. It’s actually the first time of the game RMT price to have this kind of situation after had been running very stably throughout the year. However, EVE Online ISK was still staying at the range of $36 USD per 2bn EVE ISK on a normal day as usual. This month CCP released a new update coming with pirate faction capital and supercapital ships, rewards, visual, and more. And it didn’t, again, have any impact on RMT price. EVE Online ISK should still be staying in this range next month. The cheapest was on June 10, 2016, which is 2bn EVE ISK for $25.80 and the most expensive was on June 30, 2016, for $36.00. It is as high as 39.53% different. Although the impact of patch 3.3 is not as great as its previous update, FFXIV Gil price has been increasing significantly after the patch day as predicted. Within a single day of the patch date, the price increased as great as 40.11% and had been being in this range for the rest of the month. It is expected from the current one of the biggest MMOs in this generation. This high price should stay for a month of two because of the recent cooperation with Amazon and upcoming Fan 2016 festival. 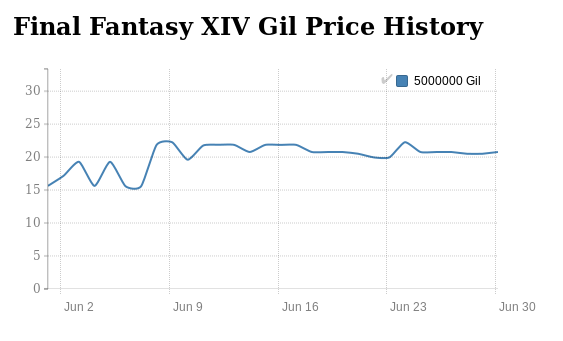 Final Fantasy XIV Gil price is expected to be in the range of $20 USD per 5m Gil in July. The cheapest was on June 06, 2016, which is 5mn FFXIV Gil for $15.57 and the most expensive was on June 09, 2016 for $22.25. It had a high 42.90% increase. Guild Wars 2 Pro Leagues didn’t have any impact to its in-game currency price at all even though having the $400,000 USD price pool. Guild Wars 2 Gold price in June was pretty much the same as in May, still as low as $11 USD per 500 gold. On the positive side, it did not go down again after reached its lowest price in April. GW2 RMT price should not change much in the upcoming month. The cheapest was on June 09, 2016 which is 200 Guild Wars 2 Gold for $9.64 and the most expensive was on June 22, 2016, for $12.17. It is still as high as 26.24% difference. 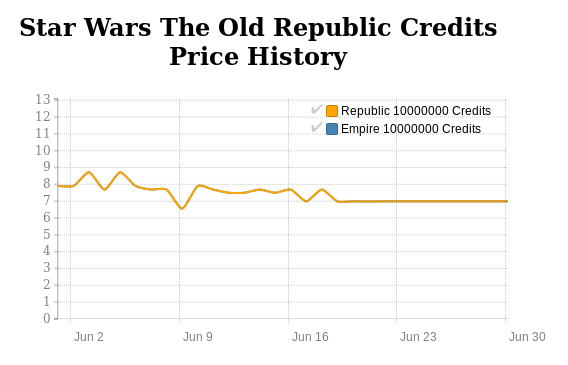 As predicted by our last month RMT Roundup, SWTOR US Credits price went down again in June. This caused it to be the lowest price ever in 2016. KOTFE monthly update on June 3 did not have any impact at all on the in-game currency price. BioWare current plan is to keep adding a new content. Its recent event “Dark vs. Light Takes Over the Star Wars;The Old Republic Galaxy” served as a way to create more contents based on player’s interaction. Let’s see how it goes. SWTOR Credit Price in July should not change much. It might be slightly higher in an early week. The cheapest was on June 9, 2016, which is 10mn SWTOR US Credits for $6.55 and the most expensive was on June 05, 2016 for $8.72. It was more than 33.13% decrease. WildStar US Gold price quite fluctuated in June. It seems to have a good start after its recent 1.5.1 update causing the RMT price to have a sudden 28% rise. However, it quickly returned to a normal price a few days later and, worse, regularly went down, sometimes more than 25% drop. Although new updates, summer sales, and items were added in WildStar, it didn’t have a big impact the same way it does for Tera. NCSOFT is finding a way to boost the game popularity by launching Heroes Evolved Update within a new few months, bringing a new way of character progression. Until its release, WildStar Gold price should be on a decline again. The cheapest was on June 24, 2016, which is 5,000 gold for $29.28 and the most expensive was on June 10, 2016, for $49.40. The discrepancy rate was very high at 68.72%. World of Warcraft Gold is once again on the rise starting from the second week of June. After staying in the range of $16.7 USD per 50k gold for a few weeks, WoW Gold price had been increasing continuously and ended up at $20 USD for the same amount of gold. This wasn’t a surprise increase because of many upcoming events on the World of Warcraft. New Legion patch note, BlizzCon 2016, and even WoW Area World Championship are on the way. These should be more than enough to create hype to their fans and cause WoW Gold price to keep up and down. It’s predicted that WoW Gold price should stay in this the range of $20 USD for a while and becomes higher after the Legion Beta. The cheapest was on June 27, 2016, which is 50,000 gold for $16.34 and the most expensive was on June 05, 2016 for $19.37. It was 18.54% different. The cheapest was on June 01, 2016 which is 50,000 gold for $16.83 and the most expensive was on June 23, 2016, for $20.69. It was a 22.94% rise.